یک سحابی سیاره‌نما (به انگلیسی: planetary nebula) نوعی سحابی گسیلشی است که از گاز و پلاسما تشکیل شده‌است این نوع سحابی‌ها پس از مرگ ستارگان به وجود می‌آیند. این نام از قرن هجدهم به وجود آمده‌است و هنگامی که به علت حلقوی بودن این سحابی‌ها(که خود به خاطر انفجار ستاره‌است) در تلسکوپ‌های ضعیف به شکل یک سیاره دیده و اشتباه گرفته می‌شد. مدت عمر این سحابی‌ها کوتاه و حدود ده هزار سال در مقابل با عمر چند میلیون سالهٔ ستاره است. نواحی روشن از گاز یونیده، نه تنها کنار ستارگان تازه متولد شده، بلکه اطراف ستاره‌هایی که آخرین مراحل تحول خود را سپری می‌کنند نیز دیده می‌شود. سحابی سیاره‌ای عبارت است از یک پوستهٔ گازی به دور یک ستاره آبی داغ و کوچک. در زمان تحول ستاره و در مرحلهٔ هلیوم‌سوزی، ممکن است ناپایداری‌هایی بروز کند. برخی ستارگان شروع به تپش می‌کنند، در حالی که در دیگر ستاره‌ها ممکن است تمام اتمسفر بیرونی به فضا پرتاب شود. در حالت اخیر، یک پوستهٔ گازی که با سرعت ۲۰ تا۳۰ کیلومتر بر ثانیه در حال انبساط است اطراف یک ستاره کوچک و داغ (دمای ۵۰۰۰۰ تا ۱۰۰۰۰۰ کلوین) تشکیل خواهد شد. این ستارهٔ کوچک، هستهٔ ستارهٔ اولیه است. تابش فرابنفش ستارهٔ مرکزی، گاز در حال انبساط را در سحابی سیاره‌ای به یون تبدیل می‌کند. بسیاری از خطوط نشری روشنی که در یک ناحیهٔ اچ ۲ دیده می‌شود، در طیف این گاز وجود دارد. البته سحابی‌های سیاره‌ای عموماً از بیش‌تر نواحی اچ 2 خیلی متقارن‌ترند و سریع‌تر منبسط می‌شوند. برای مثال، سحابی حلقوی معروف در صورت فلکی شلیاق، M57، به‌وضوح در تصاویری که در مدت ۵۰ سال گرفته شده منبسط شده است. در مدت چند ده هزار سال، سحابی‌های سیاره‌ای در محیط بین‌ستاره‌ای محو شده، ستارهٔ مرکزی آن‌ها سرد، و به کوتوله سفید تبدیل می‌گردد. قطر ظاهری کوچک‌ترین سحابی شناخته شده تنها چند ثانیه قوسی است؛ در حالی که در بزرگ‌ترین آن‌ها، مانند سحابی مارپیچ (Helix Nebula)، ممکن است به یک درجه برسد. برآورد می‌شود که تعداد کل سحابی‌های سیاره‌ای در کهکشان راه شیری،۵۰۰۰۰ باشد. تاکنون حدود ۲۰۰۰ سحابی سیاره‌ای رصد شده است. جوانترین سحابی سیاره‌ای مشاهده شده سحابی پرتوماهی است. در ویکی‌انبار پرونده‌هایی دربارهٔ سحابی سیاره‌نما موجود است. A planetary nebula, abbreviated as PN or plural PNe, is a type of emission nebula consisting of an expanding, glowing shell of ionized gas ejected from red giant stars late in their lives. The term "planetary nebula" is arguably a misnomer because they are unrelated to planets or exoplanets. The true origin of the term was likely derived from the planet-like round shape of these nebulae as observed by astronomers through early telescopes, and although the terminology is inaccurate, it is still used by astronomers today. The first usage may have occurred during the 1780s with the English astronomer William Herschel who described these nebulae as resembling planets; however, as early as January 1779, the French astronomer Antoine Darquier de Pellepoix described in his observations of the Ring Nebula, "...a very dim but perfectly outlined; it is as large as Jupiter and resembles a fading planet." All planetary nebulae form at the end of intermediate massed star's lifetimes. They are a relatively short-lived phenomenon, lasting perhaps a few tens of thousands of years, compared to a considerably longer phases of stellar evolution. Once all of the red giant's atmosphere has been dissipated, energetic ultraviolet radiation from the exposed hot luminous core, called a planetary nebula nucleus (PNN), ionizes the ejected material. 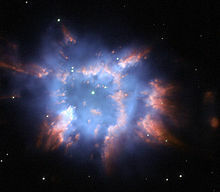 Absorbed ultraviolet light then energises the shell of nebulous gas around the central star, causing it to appear as a brightly coloured planetary nebula. Planetary nebulae likely play a crucial role in the chemical evolution of the Milky Way by expelling elements into the interstellar medium from stars where those elements were created. Planetary nebulae are observed in more distant galaxies, yielding useful information about their chemical abundances. Starting from the 1990s, Hubble Space Telescope images revealed that many planetary nebulae have extremely complex and varied morphologies. About one-fifth are roughly spherical, but the majority are not spherically symmetric. The mechanisms that produce such a wide variety of shapes and features are not yet well understood, but binary central stars, stellar winds and magnetic fields may play a role. NGC 7293, the Helix Nebula. NGC 2392, the Eskimo Nebula. The first planetary nebula discovered (though not yet termed as such) was the Dumbbell Nebula in the constellation of Vulpecula. It was observed by Charles Messier in 1764 and listed as M27 in his catalogue of nebulous objects. To early observers with low-resolution telescopes, M27 and subsequently discovered planetary nebulae resembled the giant planets like Uranus. William Herschel, discoverer of Uranus, perhaps coined the term "planetary nebula". However, in as early as January 1779, the French astronomer Antoine Darquier de Pellepoix described in his observations of the Ring Nebula, "a very dull nebula, but perfectly outlined; as large as Jupiter and looks like a fading planet."" 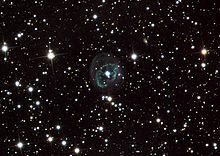 Whatever the true origin of the term, the label "planetary nebula" became ingrained in the terminology used by astronomers to categorize these types of nebulae, and is still in use by astronomers today. "These are celestial bodies of which as yet we have no clear idea and which are perhaps of a type quite different from those that we are familiar with in the heavens. I have already found four that have a visible diameter of between 15 and 30 seconds. These bodies appear to have a disk that is rather like a planet, that is to say, of equal brightness all over, round or somewhat oval, and about as well defined in outline as the disk of the planets, of a light strong enough to be visible with an ordinary telescope of only one foot, yet they have only the appearance of a star of about ninth magnitude." Herschel assigned these to Class IV of his catalogue of "nebulae", eventually listing 78 "planetary nebulae", most of which are in fact galaxies. The nature of planetary nebulae remained unknown until the first spectroscopic observations were made in the mid-19th century. Using a prism to disperse their light, William Huggins was one of the earliest astronomers to study the optical spectra of astronomical objects. 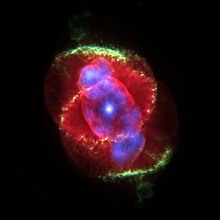 On August 29, 1864, Huggins was the first to analyze the spectrum of a planetary nebula when he observed Cat's Eye Nebula. His observations of stars had shown that their spectra consisted of a continuum of radiation with many dark lines superimposed. He found that many nebulous objects such as the Andromeda Nebula (as it was then known) had spectra that were quite similar. 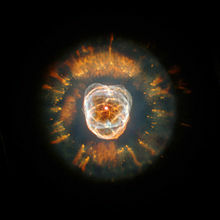 However, when Huggins looked at the Cat's Eye Nebula, he found a very different spectrum. Rather than a strong continuum with absorption lines superimposed, the Cat's Eye Nebula and other similar objects showed a number of emission lines. Brightest of these was at a wavelength of 500.7 nanometres, which did not correspond with a line of any known element. At first, it was hypothesized that the line might be due to an unknown element, which was named nebulium. A similar idea had led to the discovery of helium through analysis of the Sun's spectrum in 1868. While helium was isolated on Earth soon after its discovery in the spectrum of the Sun, "nebulium" was not. In the early 20th century, Henry Norris Russell proposed that, rather than being a new element, the line at 500.7 nm was due to a familiar element in unfamiliar conditions. Physicists showed in the 1920s that in gas at extremely low densities, electrons can occupy excited metastable energy levels in atoms and ions that would otherwise be de-excited by collisions that would occur at higher densities. Electron transitions from these levels in nitrogen and oxygen ions (O+, O2+ (a.k.a. O iii), and N+) give rise to the 500.7 nm emission line and others. These spectral lines, which can only be seen in very low density gases, are called forbidden lines. Spectroscopic observations thus showed that nebulae were made of extremely rarefied gas. Planetary nebula NGC 3699 is distinguished by an irregular mottled appearance and a dark rift. The central stars of planetary nebulae are very hot. Only when a star has exhausted most of its nuclear fuel can it collapse to a small size. Planetary nebulae came to be understood as a final stage of stellar evolution. Spectroscopic observations show that all planetary nebulae are expanding. This led to the idea that planetary nebulae were caused by a star's outer layers being thrown into space at the end of its life. Towards the end of the 20th century, technological improvements helped to further the study of planetary nebulae. Space telescopes allowed astronomers to study light wavelengths outside those that the Earth's atmosphere transmits. Infrared and ultraviolet studies of planetary nebulae allowed much more accurate determinations of nebular temperatures, densities and elemental abundances. Charge-coupled device technology allowed much fainter spectral lines to be measured accurately than had previously been possible. The Hubble Space Telescope also showed that while many nebulae appear to have simple and regular structures when observed from the ground, the very high optical resolution achievable by telescopes above the Earth's atmosphere reveals extremely complex structures. Under the Morgan-Keenan spectral classification scheme, planetary nebulae are classified as Type-P, although this notation is seldom used in practice. Computer simulation of the formation of a planetary nebula from a star with a warped disk, showing the complexity which can result from a small initial asymmetry. Stars greater than 8 solar masses (M⊙) will likely end their lives in dramatic supernovae explosions, while planetary nebulae seemingly only occur at the end of the lives of intermediate and low mass stars between 0.8 M⊙ to 8.0 M⊙. 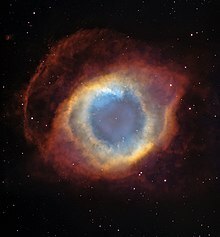 Progenitor stars that form planetary nebulae will spend most of their lifetimes converting their hydrogen into helium in the star's core by nuclear fusion at about 15 million K. This generated energy creates outward pressure from fusion reactions in the core, balancing the crushing inward pressures of the star's gravity. This state of equilibrium is known as the main sequence, which can last for tens of millions to billions of years, depending on the mass. When the hydrogen source in the core starts to diminish, gravity starts compressing the core, causing a rise in temperature to about 100 million K. Such higher core temperatures then make the star's cooler outer layers expand to create much larger red giant stars. This end phase causes a dramatic rise in stellar luminosity, where the released energy is distributed over a much larger surface area, even though the average surface temperature is lower. In stellar evolution terms, stars undergoing such increases in luminosity are known as asymptotic giant branch stars (AGB). During this phase, the star can lose 50 to 70% of its total mass from its stellar wind. For the more massive asymptotic giant branch stars that form planetary nebulae, whose progenitors exceed about 3M⊙, their cores will continue to contract. When temperatures reach about 100 million K, the available helium nuclei fuse into carbon and oxygen, so that the star again resumes radiating energy, temporarily stopping the core's contraction. This new helium burning phase (fusion of helium nuclei) forms a growing inner core of inert carbon and oxygen. Above it is a thin helium-burning shell, surrounded in turn by a hydrogen-burning shell. However, this new phase lasts only 20,000 years or so, a short period compared to the entire lifetime of the star. In either scenario, the venting of atmosphere continues unabated into interstellar space, but when the outer surface of the exposed core reaches temperatures exceeding about 30,000 K, there are enough emitted ultraviolet photons to ionize the ejected atmosphere, causing the gas to shine as a planetary nebula. 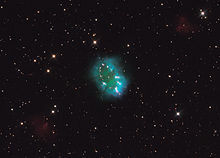 The Necklace Nebula consists of a bright ring, measuring about two light-years across, dotted with dense, bright knots of gas that resemble diamonds in a necklace. The knots glow brightly due to absorption of ultraviolet light from the central stars. After a star passes through the asymptotic giant branch (AGB) phase, the short planetary nebula phase of stellar evolution begins as gases blow away from the central star at speeds of a few kilometers per second. The central star is the remnant of its AGB progenitor, an electron-degenerate carbon-oxygen core that has lost most of its hydrogen envelope due to mass loss on the AGB. As the gases expand, the central star undergoes a two-stage evolution, first growing hotter as it continues to contract and hydrogen fusion reactions occur in the shell around the core and then slowly cooling when the hydrogen shell is exhausted through fusion and mass loss. In the second phase, it radiates away its energy and fusion reactions cease, as the central star is not heavy enough to generate the core temperatures required for carbon and oxygen to fuse. During the first phase, the central star maintains constant luminosity, while at the same time it grows ever hotter, eventually reaching temperatures around 100,000 K. In the second phase, it cools so much that it does not give off enough ultraviolet radiation to ionize the increasingly distant gas cloud. The star becomes a white dwarf, and the expanding gas cloud becomes invisible to us, ending the planetary nebula phase of evolution. For a typical planetary nebula, about 10,000 years passes between its formation and recombination of the resulting plasma. Planetary nebulae may play a very important role in galactic evolution. Newly born stars consist almost entirely of hydrogen and helium, but as stars evolve through the asymptotic giant branch phase, they create heavier elements via nuclear fusion which are eventually expelled by strong stellar winds. Planetary nebulae usually contain larger proportions of elements such as carbon, nitrogen and oxygen, and these are recycled into the interstellar medium via these powerful winds. In turn, planetary nebulae greatly enrich the Milky Way and their nebulae with these heavier elements – collectively known by astronomers as metals and specifically referred to by the metallicity parameter Z. Subsequent generations of stars formed from such nebulae also tend to have higher metallicities. Although these metals are present in stars in relatively tiny amounts, they have marked effects on stellar evolution and fusion reactions. When stars formed earlier in the universe they theoretically contained smaller quantities of heavier elements. Known examples are the metal poor Population II stars. (See Stellar population). Identification of stellar metallicity content is found by spectroscopy. 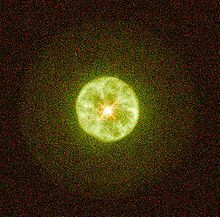 Lemon slice nebula (IC 3568). A typical planetary nebula is roughly one light year across, and consists of extremely rarefied gas, with a density generally from 100 to 10,000 particles per cm3. (The Earth's atmosphere, by comparison, contains 2.5×1019 particles per cm3.) Young planetary nebulae have the highest densities, sometimes as high as 106 particles per cm3. As nebulae age, their expansion causes their density to decrease. The masses of planetary nebulae range from 0.1 to 1 solar masses. Radiation from the central star heats the gases to temperatures of about 10,000 K. The gas temperature in central regions is usually much higher than at the periphery reaching 16,000–25,000 K. The volume in the vicinity of the central star is often filled with a very hot (coronal) gas having the temperature of about 1,000,000 K. This gas originates from the surface of the central star in the form of the fast stellar wind. Nebulae may be described as matter bounded or radiation bounded. In the former case, there is not enough matter in the nebula to absorb all the UV photons emitted by the star, and the visible nebula is fully ionized. In the latter case, there are not enough UV photons being emitted by the central star to ionize all the surrounding gas, and an ionization front propagates outward into the circumstellar envelope of neutral atoms. About 3000 planetary nebulae are now known to exist in our galaxy, out of 200 billion stars. Their very short lifetime compared to total stellar lifetime accounts for their rarity. They are found mostly near the plane of the Milky Way, with the greatest concentration near the galactic center. This animation shows how the two stars at the heart of a planetary nebula like Fleming 1 can control the creation of the spectacular jets of material ejected from the object. Only about 20% of planetary nebulae are spherically symmetric (for example, see Abell 39). A wide variety of shapes exist with some very complex forms seen. Planetary nebulae are classified by different authors into: stellar, disk, ring, irregular, helical, bipolar, quadrupolar, and other types, although the majority of them belong to just three types: spherical, elliptical and bipolar. Bipolar nebulae are concentrated in the galactic plane, likely produced by relatively young massive progenitor stars; and bipolars in the galactic bulge appear to prefer orienting their orbital axes parallel to the galactic plane. 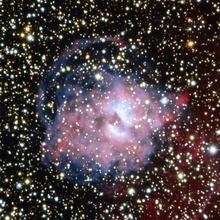 On the other hand, spherical nebulae are likely produced by the old stars similar to the Sun. The huge variety of the shapes is partially the projection effect—the same nebula when viewed under different angles will appear different. Nevertheless, the reason for the huge variety of physical shapes is not fully understood. 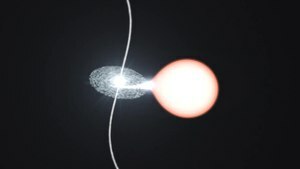 Gravitational interactions with companion stars if the central stars are binary stars may be one cause. Another possibility is that planets disrupt the flow of material away from the star as the nebula forms. It has been determined that the more massive stars produce more irregularly shaped nebulae. In January 2005, astronomers announced the first detection of magnetic fields around the central stars of two planetary nebulae, and hypothesized that the fields might be partly or wholly responsible for their remarkable shapes. Abell 78, 24 inch telescope on Mt. Lemmon, AZ. Courtesy of Joseph D. Schulman. Planetary nebulae have been detected as members in four Galactic globular clusters: Messier 15, Messier 22, NGC 6441 and Palomar 6. Evidence also points to the potential discovery of planetary nebulae in globular clusters in the galaxy M31. However, there is currently only one case of a planetary nebula discovered in an open cluster that is agreed upon by independent researchers. That case pertains to the planetary nebula PHR 1315-6555 and the open cluster Andrews-Lindsay 1. Indeed, through cluster membership, PHR 1315-6555 possesses among the most precise distances established for a planetary nebula (i.e., a 4% distance solution). The cases of NGC 2818 and NGC 2348 in Messier 46, exhibit mismatched velocities between the planetary nebulae and the clusters, which indicates they are line-of-sight coincidences. A subsample of tentative cases that may potentially be cluster/PN pairs includes Abell 8 and Bica 6, and He 2-86 and NGC 4463. Theoretical models predict that planetary nebulae can form from main-sequence stars of between one and eight solar masses, which puts the progenitor star's age at greater than 40 million years. Although there are a few hundred known open clusters within that age range, a variety of reasons limit the chances of finding a planetary nebula within. For one reason, the planetary nebula phase for more massive stars is on the order of thousands of years, which is a blink of the eye in cosmic terms. Also, partly because of their small total mass, open clusters have relatively poor gravitational cohesion and tend to disperse after a relatively short time, typically from 100 to 600 million years. Odd pair of aging stars sculpt spectacular shape of planetary nebula. Tiny planetary nebula NGC 6886. The distances to planetary nebulae are generally poorly determined. It is possible to determine distances to the nearest planetary nebula by measuring their expansion rates. High resolution observations taken several years apart will show the expansion of the nebula perpendicular to the line of sight, while spectroscopic observations of the Doppler shift will reveal the velocity of expansion in the line of sight. Comparing the angular expansion with the derived velocity of expansion will reveal the distance to the nebula. The issue of how such a diverse range of nebular shapes can be produced is a debatable topic. It is theorised that interactions between material moving away from the star at different speeds gives rise to most observed shapes. However, some astronomers postulate that close binary central stars might be responsible for the more complex and extreme planetary nebulae. Several have been shown to exhibit strong magnetic fields, and their interactions with ionized gas could explain some planetary nebulae shapes. There are two main methods of determining metal abundances in nebulae. These rely on recombination lines and collisionally excited lines. Large discrepancies are sometimes seen between the results derived from the two methods. This may be explained by the presence of small temperature fluctuations within planetary nebulae. 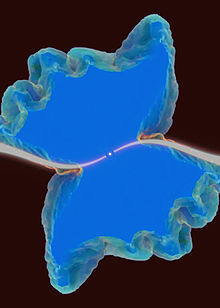 The discrepancies may be too large to be caused by temperature effects, and some hypothesize the existence of cold knots containing very little hydrogen to explain the observations. However, such knots have yet to be observed. ^ a b Darquier, A. (1777). Observations astronomiques, faites à Toulouse (Astronomical observations, made in Toulouse). Avignon: J. Aubert; (and Paris: Laporte, etc.). ^ a b Olson, Don; Caglieris, Giovanni Maria (June 2017). "Who Discovered the Ring Nebula?". Sky & Telescope. pp. 32–37. ^ a b Wolfgang Steinicke. "Antoine Darquier de Pellepoix". Retrieved 9 June 2018. ^ Hoskin, Michael (2014). "William Herschel and the Planetary Nebulae". Journal for the History of Astronomy. 45 (2): 209–225. Bibcode:2014JHA....45..209H. doi:10.1177/002182861404500205. ^ Quoted in Hoskin, Michael (2014). "William Herschel and the Planetary Nebulae". Journal for the History of Astronomy. 45 (2): 209–225. Bibcode:2014JHA....45..209H. doi:10.1177/002182861404500205. ^ p. 16 in Mullaney, James (2007). The Herschel Objects and How to Observe Them. Astronomers' Observing Guides. Bibcode:2007hoho.book.....M. doi:10.1007/978-0-387-68125-2. ISBN 978-0-387-68124-5. ^ "A Planetary Nebula Divided". Retrieved 21 December 2015. ^ Wood, P. R.; Olivier, E. A.; Kawaler, S. D. (2004). "Long Secondary Periods in Pulsating Asymptotic Giant Branch Stars: An Investigation of Their Origin". The Astrophysical Journal. 604 (2): 800. Bibcode:2004ApJ...604..800W. doi:10.1086/382123. ^ "Hubble Offers a Dazzling Necklace". Picture of the Week. ESA/Hubble. Retrieved 18 August 2011. ^ Sackmann, I. -J.; Boothroyd, A. I.; Kraemer, K. E. (1993). "Our Sun. III. Present and Future". The Astrophysical Journal. 418: 457. Bibcode:1993ApJ...418..457S. doi:10.1086/173407. ^ Castor, J.; McCray, R.; Weaver, R. (1975). "Interstellar Bubbles". Astrophysical Journal Letters. 200: L107–L110. Bibcode:1975ApJ...200L.107C. doi:10.1086/181908. ^ Pan, Liubin; Scannapieco, Evan; Scalo, Jon (1 October 2013). "Modeling the Pollution of Pristine Gas in the Early Universe". The Astrophysical Journal. 775 (2): 111. arXiv:1306.4663. Bibcode:2013ApJ...775..111P. doi:10.1088/0004-637X/775/2/111. ^ Gregory, Stephen A.; Michael Zeilik (1998). Introductory astronomy & astrophysics (4. ed.). Fort Worth [u.a. ]: Saunders College Publ. p. 322. ISBN 0-03-006228-4. ^ Chen, Z; A. Frank; E. G. Blackman; J. Nordhaus; J. Carroll-Nellenback (2017). "Mass Transfer and Disc Formation in AGB Binary Systems". Monthly Notices of the Royal Astronomical Society. 468 (4): 4465. arXiv:1702.06160. Bibcode:2017MNRAS.468.4465C. doi:10.1093/mnras/stx680. ^ "Cosmic Sprinklers Explained". ESO Press Release. Retrieved 13 February 2013. ^ R. Gathier. "Distances to Planetary Nebulae" (PDF). ESO Messenger. Retrieved 31 May 2014. Frankowski, Adam; Soker, Noam (November 2009), "Very late thermal pulses influenced by accretion in planetary nebulae", New Astronomy, 14 (8): 654–8, arXiv:0903.3364, Bibcode:2009NewA...14..654F, doi:10.1016/j.newast.2009.03.006, A planetary nebula (PN) is an expanding ionized circumstellar cloud that was ejected during the asymptotic giant branch (AGB) phase of the stellar progenitor. Kwok, Sun; Su, Kate Y. L. (December 2005), "Discovery of Multiple Coaxial Rings in the Quadrupolar Planetary Nebula NGC 6881", The Astrophysical Journal, 635 (1): L49–52, Bibcode:2005ApJ...635L..49K, doi:10.1086/499332, We report the discovery of multiple two-dimensional rings in the quadrupolar planetary nebula NGC 6881. As many as four pairs of rings are seen in the bipolar lobes, and three rings are seen in the central torus. While the rings in the lobes have the same axis as one pair of the bipolar lobes, the inner rings are aligned with the other pair. The two pairs of bipolar lobes are likely to be carved out by two separate high-velocity outflows from the circumstellar material left over from the asymptotic giant branch (AGB) wind. The two-dimensional rings could be the results of dynamical instabilities or the consequence of a fast outflow interacting with remnants of discrete AGB circumstellar shells. Kwok, Sun; Koning, Nico; Huang, Hsiu-Hui; Churchwell, Edward (2006), Barlow, M. J.; Méndez, R. H., eds., "Planetary nebulae in the GLIMPSE survey", Proceedings of the International Astronomical Union, Symposium #234, Planetary Nebulae in our Galaxy and Beyond, Cambridge: Cambridge University Press, 2 (S234): 445–6, Bibcode:2006IAUS..234..445K, doi:10.1017/S1743921306003668, Planetary nebulae (PNs) have high dust content and radiate strongly in the infrared. For young PNs, the dust component accounts for ∼1/3 of the total energy output of the nebulae (Zhang & Kwok 1991). The typical color temperatures of PNs are between 100 and 200 K, and at λ >5 μm, dust begins to dominate over bound-free emission from the ionized component. Although PNs are traditionally discovered through examination of photographic plates or Hα surveys, PNs can also be identified in infrared surveys by searching for red objects with a rising spectrum between 4–10 μm. Maciel, W. J.; Costa, R. D. D.; Idiart, T. E. P. (October 2009), "Planetary nebulae and the chemical evolution of the Magellanic Clouds", Revista Mexicana de Astronomía y Astrofísica, 45: 127–37, arXiv:0904.2549, Bibcode:2009RMxAA..45..127M, These objects are produced by low and intermediate mass stars, with main sequence masses roughly between 0.8 and 8 M⊙, and present a reasonably large age and metallicity spread. Wikimedia Commons has media related to Planetary nebulae. این صفحه آخرین‌بار در ‏۳۰ اوت ۲۰۱۶ ساعت ‏۱۱:۴۱ ویرایش شده‌است.